I've had this set on my bike for almost a year now. I had Dura-Ace DI2 on the bike before and never really felt comfortable. The long, deeply scalloped hoods on Shimano levers resulted in too much weight on my hands, and they'd start to cramp after 50 miles. As a result, this bike mostly sat in the garage while I rode my other road bike. When SRAM introduced ETap, I was intrigued and decided to give it a try. It was super-easy to install - I like the lack of wires. Shifting is as reliable as DI2 and have grown to LOVE the two lever shift action. I thought this would be hard to get used to, but it very quickly became second-nature. Being able to quickly remove the batteries and take them inside to charge is great. But it would be nice if it was a little easier to tell when the batteries need a charge. The little lights on the derailleurs are hard to see. My biggest gripe is with the shifting speed. I've got a fair amount of experience riding both Campagnolo EPS and DI2. There is nothing that compares with Super-record EPS, but even DI2 is considerably quicker to respond to lever action than ETap. I assume that this is because the electronics have to wait to determine if you are pushing one or both levers, and perhaps the wireless communication is a bit slower, but I hope they can improve this in future generations. I'm not saying that it is terrible, but there is definitely a noticeable lag from lever push to action. I've had a lot of riding time on electronic groupsets from Campagnolo and Shimano, so it was interesting to compare the performance of SRAM's new electronic gruppo. There are a lot of things to like about this groupset. It is incredibly easy to install on any bike, even one that was not designed for electronic. For people upgrading from a mechanical group, I'd highly recommend taking a look. I like the approach to the batteries. Charging is easy and fast (easier than the other two systems since the batteries can be very simply removed and brought inside for charging instead of trying to find a plug near your bike), and it's nice to be able to easily switch between the front and rear derailleur if you forget to charge and run out of juice while you're on a ride. My favorite electronic Groupset is the Campagnolo Super Record EPS, and my time with SRAM e-tap hasn't changed my opinion. However, the SRAM e-tap is significantly less expensive. much easier to install, and works quite well. The availability of the Quarq SRAM e-tap crankset is also a plus if you want power measurement. I was surprised how easy it was to get used to the very different controls on the e-tap. I think the fact that the controls are so different than Shimano's or Campy's makes it easier to switch back and forth without being confused. On my first 50 mile ride, I think I only hit the wrong paddle once. It's actually quite intuitive once you start using it. In case you're not aware, SRAM e-tap has a single paddle per side. Pushing the right paddle shifts the rear derailleur to a smaller cog. Pushing the left paddle shifts the rear derailleur to a larger cog. Multiple shifts can be accomplished by simply holding one or the other paddle. Shifting the front derailleur is done by pushing both paddles simultaneously. This may seem pretty weird, but it's actually quite easily to get used to and works well. The pressure required to trigger a shift is a bit higher than Shimano, and quite a bit higher than my Campy EPS. This probably took more getting used to than the radically different control functions. After an hour or so of riding, this was less of a distraction, but if you're looking for electronic to reduce the pressure required, I'd recommend one of the other systems. On the other hand, there has been more than one occasion when I've accidentally shifted my Campy front derailleur when I hit an unexpected bump, so this may not be a bad thing. The speed of shifting was probably my biggest gripe. I've gotten used to almost instantaneous shifts on my Campy EPS. On the SRAM e-tap, I had to be a little patient to avoid hitting the paddle again thinking that I hadn't hit it hard enough on the first attempt. It's really not that slow, but in comparison to EPS or Di2, it definitely takes an extra half second or more, particularly on the front derailleur. Out of the box, the brake levers have quite a large reach. Fortunately, this can be adjusted. I have fairly large hands, but felt the default brake reach was a little excessive for my taste. I've never been a fan of the shape of Dura-Ace brake hoods (Di2 included). They are just too long, narrow, and deeply sculpted, and my hands start to cramp after 50 or so miles. The shape of the Campagnolo Record hoods is ideal for me, but the SRAM e-tap hoods are pretty close. 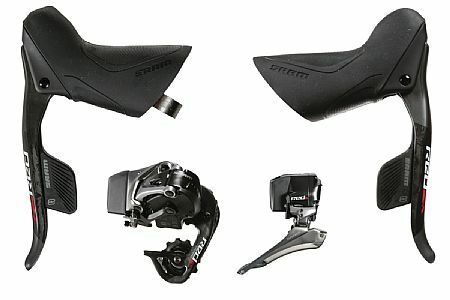 Overall, I think this is an excellent initial electronic offering by SRAM, and in several ways is ahead of the competition. As an upgrade for a mechanical-shifting bike, it's the obvious choice. Such a great system. The paddles are great if you ride with bulky gloves in the winter or have larger hands. I'm a minimalist, so the chance to reduce my bike cables from four to just two was quite compelling, plus I love electronic gadgets like wireless, electronic shifting for my Cervelo R3 road bike. My other bike is a Tarmac SL4 with eTap, and this system plain works well in all types of weather, sure shifting, time after time, no adjustments for cable stretching. The paddles are huge and easy to reach, even when wearing gloves in the winter time. Learning to shift the front derailleur takes about a minute, now it's intuitive. Sure, these won't make you cycle any faster, however the bling factor and half the cable clutter is worth something to me. I came over from a Dura Ace 9000 setup. Install was very fast and intuitive. Batteries ship with no charge, so plan on some time charging before attempting install. I would definitely recommend purchasing the matching brake calipers. I did one ride with the Dura Ace calipers and it was a terrifying decent. There is a You tube video online showing step by step setup. The setup linked with my cycle computer and shows current battery status at all times. No cables to adjust, stretch or break. I found eTap to have more intuitive shifting over Di2. Much easier shifting with winter gloves. Battery charge duration similar to Di2. Excellent quality, fit finish.